FYI, your web site wheel page for C7 is blank. Also, what are the weights for these wheels? Even a single typical weight for a wheel would be helpful. Thanks! BTW, good looking wheels and lots of finish choices. 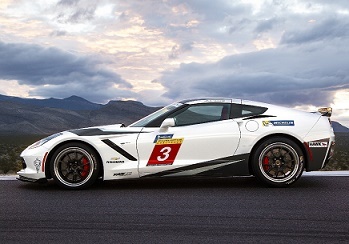 And what sizes will the Corvette challenge car be running. You can run 18x10 frt 19x11 rear that all fits up under the fenders. and run a 275/315 Hoosier combination. Some guys run 18x10 frt 18x11 rear. The issue is with the 18x11 we have a little bit of a fitment issue. The way that the suspension upper and lowers are, the angle limits us on the backspace (offset) and the wheel and tire will stick out of the fender a little bit. With the 19x11, the diameter is larger which allows us to tuck the wheel under the fender a little more. As far as the Spring Mountain cars go they are planning to use a Michelin slick that runs on the Narrow side and are currently planning to use a 19X8.5 front wheel. The rear is a 19X11. The 18x10/19x11 is a good Hooiser setup.